Franklin D. Jones has written some machine work classics this was one of them. Lindsay repinted this one, but he has closed his doors. This is a nice clean copy of the 1st edition downloaded from the Knucklebusters web site. Thanks for posting that, CB. Famous TN last words: "Hey ya'll, watch this..."
Spine is slightly rubbed but still legible , the rest of the set is well worth a read . Glad you like it Chuck. Rob very nice set in great condition. I have some of those originals but not near the complete set.Lindsay's reprint is all I could find in Modern Toolmaking Methods. I had the Lindsay reprint of Modern tool making methods as well as many other Lindsay reprints . As I fined originals I pass on the reprints .It's a shame Lindsay shut up shop . I also have the set of Kinks books you mentioned in the other post . Had to double check my bookshelves but yup I got Lindsay's hard cover gold embossed reprint.I agree great book. Oops sorry Rob I ment silver embossing. Looked gold in the light Iwas looking at it in. Very nice ROGPROV I have most of these titles though not in such great shape. While we're comparing these two are my all time favorites Joshua Rose's 2 vol. Modern Machine-Shop Practice. Its the original 1887 edition main body is in original condition the covers were tattered so I spent the money to have them professionally recovered. They are 11 X 14 and weigh about 11 lbs each. I have them on disk but to big to upload here. I believe they can be downloaded on the Internet Archive site. And I will see your very finely bound Modern machine shop practices CB with my two volumes bound as one . CB , Roses book is one of my favourite books in my collection , rather large and heavy but an excellent volume . Yes Rob thats a very nice original of Rose's work. If my covers had not been so tattered I would have left original too. All in fun yes but I took the pictures so I have to upload them its the rull. They speak for themselves. Love the ICS Shop And Foundry Practice can't bring myself to recover the originals. I will have to look out for a set of "cyclopedia of modern shop practices"
I was wondering when Mr Hasluck was going to show up . I have two sets of Audels Engineering & Mechanical Guide , both in cracking condition for being very nearly 100 years old ,I am willing to trade one set if anyone is interested . I have two sets of above , second set spine artwork detached on a few of them . It is a huge pity that the movie industry pushing for 'author plus 70' years is ruining any chance of the knowledge in these great books being available to the rest of us. While copies are occasionally for sale, they are for the most part lost to the world. Thank you for sharing the pdf file. If you enter a title inside " symbols it searches for the exact title instead of returning results for individual words. Your welcome GERRITV. Copyright law can be a deep discussion. Internet Archive is doing great things but for over a decade and a half they have been limited to mostly pre 1915-1920 titles hope their allowed to advance into the 20's and 30's. I know there was a lot of great engineering stuff published in the 30's. "Metalwork". Your Cyclopedia Of Engineering is nothing short of beautiful, your heart must have skipped a beat when you found that one. I have some of the newer Audel sets but only the occassional older title. Here are a couple more. The Amateur Mechanic is more home based than industrial very hands on diy interesting. I really like you collection of books , Build your own combat robot , any chance of a shot of the chapter page of the electric motor repair book please . One of my best collections is my Institute of mechanical engineers 1859 - 1899 they have been rebound (not by me) as the original binding was not the best . A great resource for engineering history , hows this for a line up . Your collection of Institute of Mechanical Engineers volumes looks fantastic. Beautifly illustrated, that seems to be hard to find pre about 1870 when they were few and usually at the back of the book. I do not own any but have downloaded some from the internet. Just the kind of thing I like to browse through on a cold winter night nursing a glass of the old captain's private stock in front of a warm fire. Electric Motor Repair you caught that ay. Very nice hands on book still new enough to be usefull in the shop. Really 2 volumes in one, spiral bound. The left hand section has 243 pages of wiring and winding diagrams and 32 pages of study Questions. Interesting binding , good electric motor repair books are very thin on the ground these days and that looks like a book well worth having . 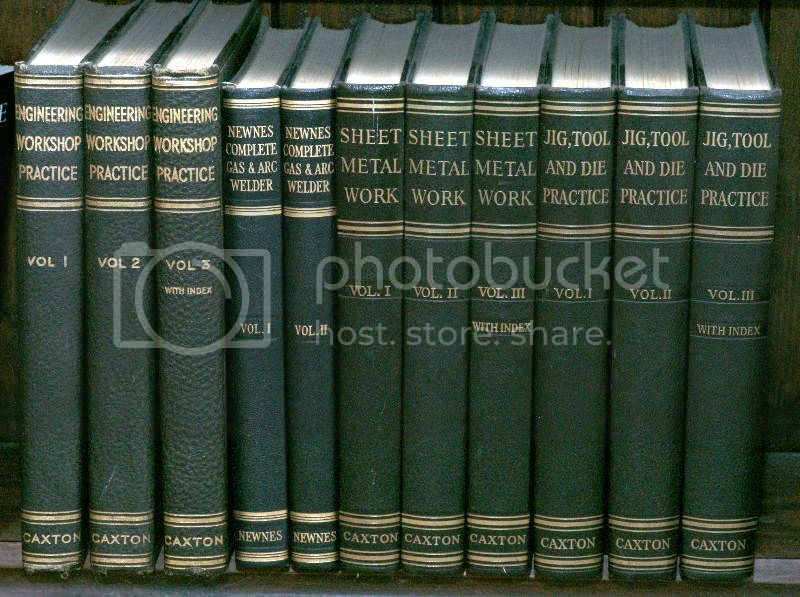 I just bought a set of Engineering Workshop Practice (3 Volume Set) and Advanced Machine Work, should be here in a week. Congrats GERRITV. I think you will enjoy them. That auction house sounds like a place I'd like to visit. It is in St Catharines, a bit of a drive for you I think. E.g. The first two are from my uncle who worked at KLM before and during WWII, the last 2 are my dad's carpentry textbook from 1930. Both amazingly useful, esp the carpentry one for joints and making window frames waterproof, a skill seemingly lost in the 21st century. Very nice GERRITV. St.Catherines is a good drive, Just the kind of thing I can add to my (too few) used book tours. The 3 volume Engineering Workshop Practice is very worthwhile. Some serious reading coming up. Very nice gerritv, excellent condition. Look like the same vintage as my set. If you like more modern sets, but still pre-automation, you will love these 2 sets. Should be more available in good condition.